Californian Joe Wright arrived in Oregon in the early 1990s and learned his winemaker skills under the guidance of Joe Dobbes at Willamette Valley Vineyards. In 2002, he met Oregon natives Mike Magee and Steve Allen and they immediately struck up a friendship leading to a shared partnership. Fueled by their passion for Pinot Noir, they started Belle Vallée (Beautiful Valley) in a former tire warehouse in downtown Corvallis. Within 5 months, Joe had converted the 22,000 sq ft space into a winery of his design. The beautiful barrel aging room is the centerpiece. 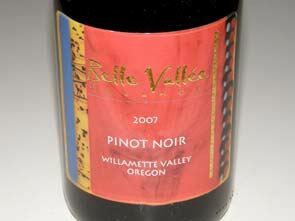 Belle Vallé has multi-year contracts with eighteen Oregon vineyards. Joe knows the vineyard owners and managers well from his years at Willamette Valley Vineyards and works closely with them. Joe is a blender rather than a single vineyard advocate. He believes blending several vineyards adds to the complexity, depth and character of the finished wine. In addition, sourcing several vineyards makes him less susceptible to the vagaries of the vintage. Every block from every vineyard is kept separate during the winemaking process, and then the barrels are painstakingly sampled and mixed to arrive at the final blend. The most magical barrels go into the Grand Cuvée bottling. The next level of quality is the Reserve and the remaining barrels are combined in the Willamette Valley blend. Joe is not bashful about his Pinot Noirs and they feature bright, copious fruit and notable oak influence. Joe also crafts an innovative Whole Cluster Pinot Noir for early drinking and a Pinot Noir Port that demands contemplation. Belle Vallée Cellars is located at 804 NW Buchanan Ave in Corvallis. This urban winery is open for tours and tasting by appointment (541-757-9463). the wines are fairly priced and may be purchased directly from the website. There is also retail distribution in Oregon. The way-cool Limited Edition Glass Label Series Magnums must be ordered in advance.